Alien-themed Crafts to be used with popular children's books about aliens. 1. Paint the bowl to look like a spaceship. 2. Glue the Slurpee Lid to the top of the bowl as shown in the picture. If you want the top of the space ship to open so you can put aliens in and out of the UFO tape it to the lid only on one side using clear packaging tape. 3. Print out the alien pattern onto card stock color it and cut it out. 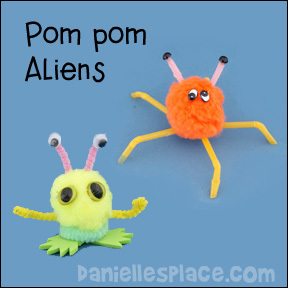 You can also make your own alien paper dolls of use the pompom aliens below. 1. Before class print out the spaceship patterns and cut them out. 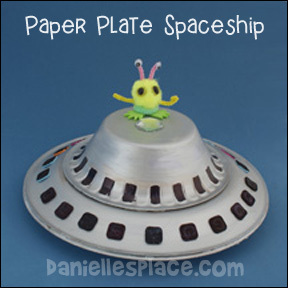 Instant Download $2.00 - Includes: Spaceship template and top of the spaceship and four aliens. 2. To make the spaceship fold a paper plate in half and use the "cutting pattern" to cut a hole in the paper plate. Place the pattern in the center of the folded edge and trace around the pattern. Cut out the shape from the paper plate by first cutting a slit through the folded edge of the paper plate and then opening the plate to cut the rest out. Fold back the flap you cut in the paper plate. Glue the edge of the paper plate together. 3. 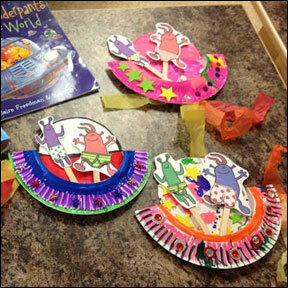 In class have your children paint or color the paper plate and then glue on craft foam shapes or gems to decorate. 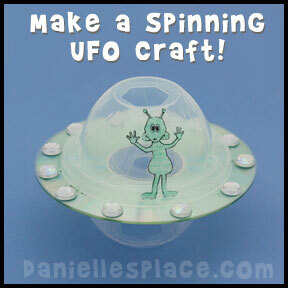 Use this craft with the popular Aliens Love Underpants books. 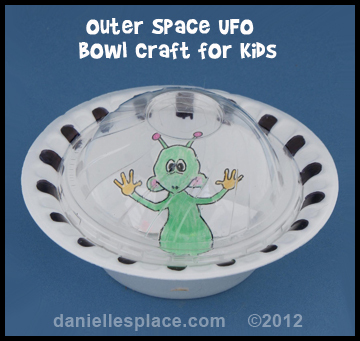 Have your children draw their own aliens or use the printable patterns. Then have them make underpants for their aliens by tracing around the outside of the aliens and filling in the missing lines to make underpants shapes. Show them how to make tabs on the sides of their patterns so they can fold them back and attach the underpants to the aliens. Visit Aliens Love Underpants Website to watch video of new underpants books, play games, and print out activity sheets and games. Use this simple paper plate craft to encourage your children to read. They will discover the limitless worlds they can visit through books and enjoy sharing those worlds with their classmates. 1. Fold a paper plate in half. 2. Cut a small slit on on the folded edge of the paper plate along the outer edge of the inside circle so that you can insert your scissors. 3. Cut around the outside of the inside circle on one half of the plate. Fold up the half circle you just cut out as shown in the picture. 4. Glue the rim of the paper plate closed so that you have a small pocket in the front of the UFO. If you don't want the pocket in the front, you can use the other side of the plate, or you can just cut off the cut half of the paper plate leaving the inside circle. 5. Print out the top of the UFO pattern and make copies. You don't have to use the pattern. You can just have your children draw on the paper plate if you would like. 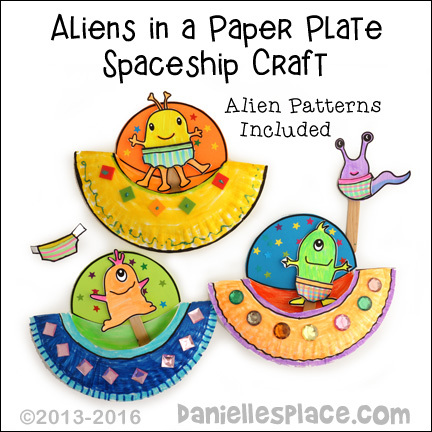 Instant Download $2.00 - Includes: Spaceship template and top of the spaceship and four aliens for activity above. 6. Instruct your children to read a book and then write on the top part of the UFO where that book took them. It may be a specific place as defined by the setting of the book or it may be somewhere in general. For example, if a child read the book "Where the Wild Things Are", he can write "I Went to Where the Wild Things Are." If he read "The Lorax", he may right, I visited the Lorax" since the book does not give the name of the town. 7. Instruct your children to draw a picture that represents the story and where they visited on the top of the paper plate UFO. If they don't like drawing, they can print a picture out from the Internet. 8. 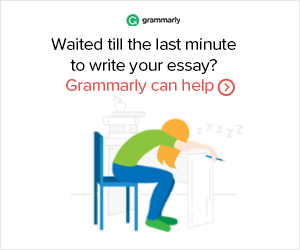 Have your children write about their journey on a separate sheet of paper. They can fold up the paper and place it in the paper plate UFO. 9. Staple the UFO's to your bulletin board after your children have shared their journey with their classmates. Grimshaw Library used this craft in their reading program. They used alien printables from the Aliens Love Underpants website. 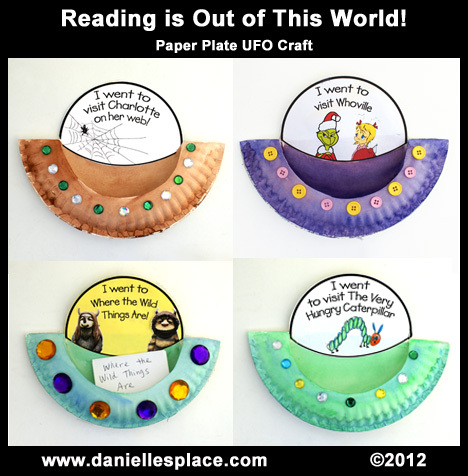 More "Out of this World" Aliens in Paper plate Space ships from the Barger Blog. ©2012, Digital by Design, Inc. -This craft, including any derivative work is copyrighted. - See Copyright Regulations for this Web Site. If you use this craft or a derivative of this craft and post it on Pinterest, please state that you got the craft from this web site. Becky from First Grade Friend-zee used this craft with her first grade class. 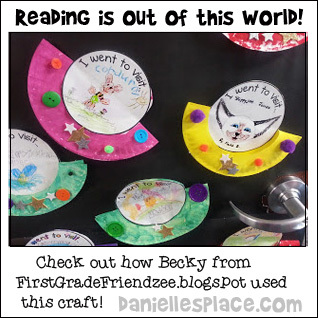 Check out her blog to see how she used it as a fun learning activity and bulletin board display for a space-themed Read-A-Thon. 1. Print out the alien pattern onto card stock color it and cut it out. Glue the alien inside one of the lids. 2. Glue a Slurpee lid to each side of an CD using a low temperature glue gun. You may want to use two CD's and glue the word sides together so that both sides of the space ship are shiny. 3. Glue gems around the outside of the CD. 4. Spin your UFO on a flat surface like you would a jack or coin. 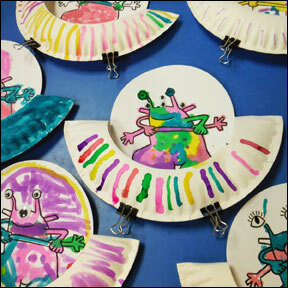 Design your own Aliens - Have your children draw pictures of as many different kinds of aliens as they can think of. Have them write descriptions of the aliens they have created. Make Aliens - Have your children make aliens using pompoms, pipe cleaners, play dough or clay, buttons, sequins, and anything else they can think off. 1. Print out the alien pattern onto card stock color it and cut it out. 2. Glue the two paper plates together, rim to rim. Then glue the bowl upside down to the center of one of the paper plates. 3. If you would like, you can cut a hole at the top of the UFO so you can place aliens in the ship. 4. Paint the space ship with acrylic paints and decorate with sequins. Use your imagination and make the craziest aliens you can think of! A comical book written from a child's perspective about his author/illustrator dad who writes a book about aliens and is apprehensive about what his sons will think about his newly published book. The illustrations are detailed and funny enhancing the rhyming story within a story. 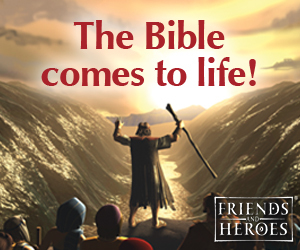 The ending will delight and surprise your children. An outer space version of the Three Little Pigs this book will delight young children. Filled with action and adventure with comical and expressive illustrations every child will love this book. Not only is it entertaining, but it also introduces children to the planets in a delightful way. Visit our Pinterest Board to see other Outer Space Crafts.